when planning for their wedding stationery is not knowing when to order what. Most often, they end up waiting too long to order their wedding invitations and then they are either rushed or have to order more standard pieces instead of option for more customized options. We see a big difference in the amount of time couples give themselves to order, customize and get their invitations. Some plan so early, they don’t yet have all the big details figured out while others wait so long they end up paying extra for rush services. Waiting too long also causes couples to settle on a less custom design because there isn’t time to create something from scratch. In most cases, it all boils down to couples not really knowing when the appropriate time is to order their wedding stationery. With so many options for wedding invitations now, it can be hard to get a definitive answer. So, when is the best time to start thinking about ordering your wedding invitations? Most stationers, including the team here at Raspberry Creative will say it’s best to give yourself at least 4 – 6 months. Wedding invitations typically should be mailed out to your invited guests two months (8 weeks) before your wedding. By ordering your invitations 4-6 months out, you have about 2-4 to design, proof, print and assemble your wedding invitations. In most cases, that is the right amount of time. Your choice of printing method, quantity, number of custom changes or other factors may impact the amount of time needed, but as a general rule 4-6 months is a good estimate. If you aren’t sure, or have less than the suggested amount of time, we suggest getting in touch with us or your preferred stationer to find out if you timeline will work. Here at Raspberry Creative, we are open by appointment only so that we can devote our undivided attention to our clients when they are here. 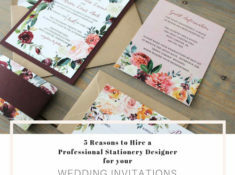 If you are interested in setting up a consultation to meet with us to discuss your wedding invitations, please contact us so that we can schedule a time to meet with your design professional. You can also schedule your free consultation online here.